Boeing 737-7L9 OY-MRI (c/n 28014/766) inbound into Amsterdam IAP on 12Oct01. 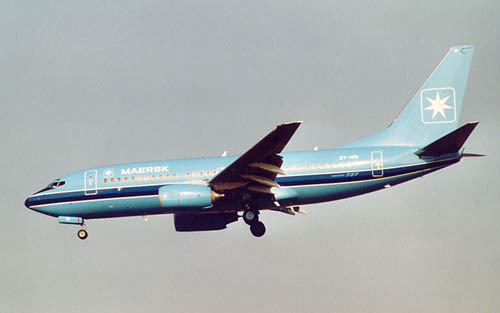 Maersk Air was founded in 1969 and this colourscheme has been carried since 1972 (info by Maersk Air, thanks Sheila !). During 2004 this colourscheme was introduced. Boeing 737-7L9 OY-MRL (c/n 28011/1203) is seen here on take off from runway 24 at Amsterdam (EHAM) IAP on 17Mar04. Maersk Air operates a fleet of 22 Boeing 737s (a mix of -500 and -700 series) plus 3 Canadair Regional Jets from its base at Copenhagen-Kastrup IAP, Denmark. The painting of our aircraft is being changed, and the first aircraft in the new design arrived at Copenhagen Airport today. The reason for the change is that airline painting of aircraft helps to create a profile for the airline and contributes to the general perception customers have of the company. By doing this we would also like to illustrate visually the change in Maersk Air from being a traditional airline mainly on the defensive against budget airlines and traditional airlines to the new Maersk Air. A Maersk Air with a new strategy involving low prices, choice of legroom on board, full flexibility of all tickets and a new comprehensive flight service to the principal cities and holiday resorts of Europe. In creating the new design, we wished to preserve the values of the A.P. Mller - Mrsk Group including the name, logo and colour choice of the ownership as well as to make clear the name Maersk on the aircraft, as this is the name by which the company is commonly known in Denmark and internationally. 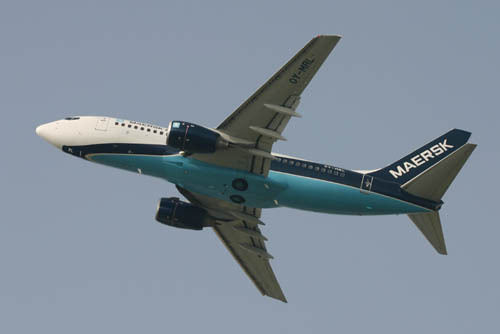 As we have mentioned before, Maersk Air is working towards a uniform fleet primarily consisting of Boeing 737-700 aircraft, which means that it is only this type of aircraft that will be painted in the new design.